To Create high-quality skincare products, using simple & natural ingredients, to inspire outdoor adventures, and always pay it forward! 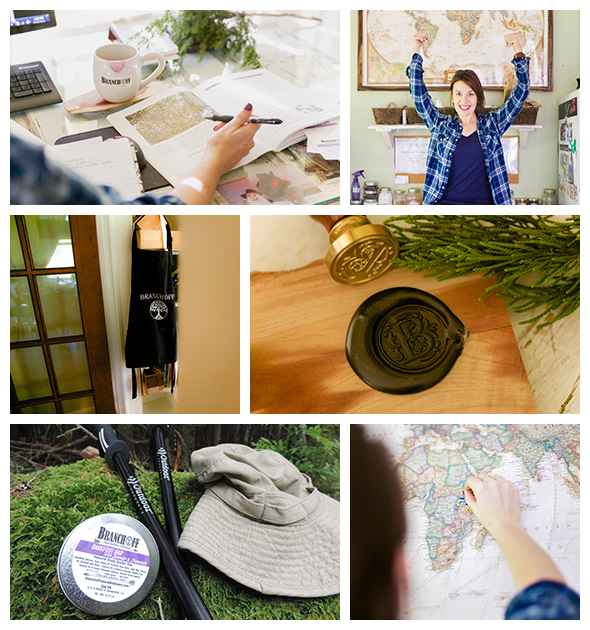 Clean products, stir an adventurous spirit, always pay it forward! My husband Mark and I are truly lovers of all things natural - particularly trees! There is just something about the supremacy of the natural world that no one can refute. 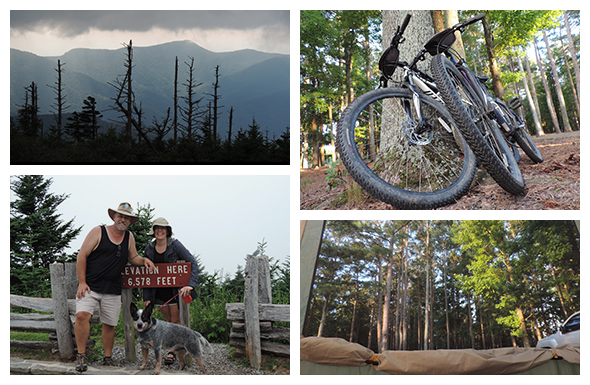 Our hobbies include hiking, biking, kayaking, and camping. Little did we know that we would go on to establish a company that embodies nature exactly. Life has a way of throwing curve balls at you, and that’s putting it mildly. After a horrific car accident, then another within a one-month span, I knew I had survived for a reason. My life was lacking passion and purpose. The sort of passion that causes your pulse to race and happy tears to well up in your eyes like shining crystals of joy! A few months following my accidents, while “paying it forward”, I finally felt not only passion but a sincere purpose in doing so. This wild richness deep in my spirit caused a type of unwavering bliss in my soul that lasted for days. I had found it! I needed to be doing something in my life that was paying it forward. I left my job and within weeks, my fiancé and I started a company. We had one very important rule: Each purchase would be paid forward somehow, someway! Welcome to our dream world! BRANCHOFF is a line of all-natural, purpose-driven body care products that are thoughtfully designed, created, labeled, and tested from start to finish with tremendous love and devotion. Now certified in aromatherapy, a professional member of the Alternative Therapy Association and the National Association of Holistic Aromatherapy, I am BRANCHOFF’S researcher, mad scientist, blender, mixologist, and designer. My husband, Mark, is absolutely the other half of me and of this company. 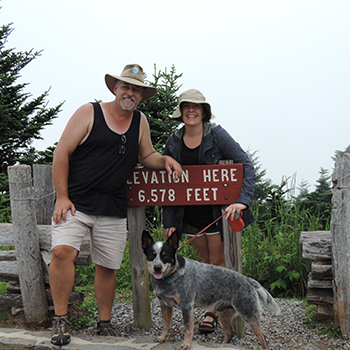 Together with our trusty blue heeler, Bear, we are team BRANCHOFF. The boys create rustic display shelves from branches and cut recycled cedar planks for gift sets which are sustainable, recyclable, as well as biodegradable. Most importantly, BRANCHOFF pays each purchase forever forward by donating funds to plant a tree with each and every purchase! Most days you can find me creating products and processing orders in the sunroom of our family’s 100-year-old farmhouse. All 9 feet of the rustic, 100-year-old, up-cycled door that is my desktop is swathed in labels, formulas, products, and packaging. Inspiration engulfs this special space, where at any time of day, nature is there magically gazing at me with her shades of browns and greens through two walls of windows. Inside our shop, words and images come alive from every nook and cranny awakening gratitude and offering inspiration. 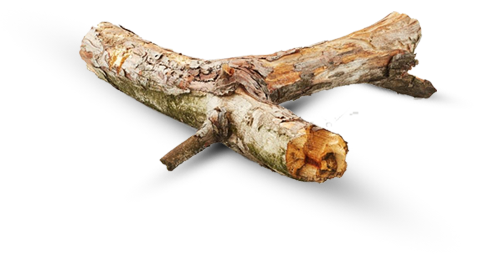 Photos of successful grass root companies stimulate our future, while the very first BRANCHOFF sign made from twigs and an old piece of barn wood hangs to remind us of how far we’ve come. Anytime the creative process needs to be rebooted, a quick glance through the walls of glass displays feasting hummingbirds, fluttering butterflies, and lizards hunting their prey. It’s in this moment that I am graciously reminded of why this business was established in the first place. Our one interior wall is adorned with a massive atlas marked with pins that show where tree plantings are happening. BRANCHOFF never belittles the power of inspiration. If we can lift someone higher, even by a millimeter, just for one second, then we have participated in a tiny miracle. In production, we mindfully consider our customers and planet. When selecting oils and butters for our products, we choose only premium ingredients: cold pressed, unrefined, or bases that are not extracted through chemical processes and 100% organic whenever possible. We buy all-natural oils which contain as many of the fruit/nut’s natural vitamins where feasible. We use recycled and recyclable packaging and circumvent the use of plastics whenever possible. Client feedback is vital to our very existence. Without feedback, many of our products would have never evolved to be as exceptional and beneficial as they are. In my opinion, customer feedback is the only way to experience positive growth! Most importantly, it was decided long before the company evolved into what it is today that each purchase would pay it forward in some very special way. 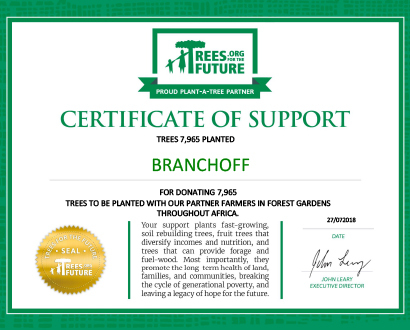 BRANCHOFF has partnered with Trees for the Future (TFTF) by donating funds from every product sold to plant a tree so that your purchase is paid forever forward. By planting trees, we are not only helping thousands of people to live sustainably; but also, nurturing hundreds of acres of ecosystems back to life. This endeavor allows BRANCHOFF, and our customers, the opportunity to become a part of something far greater than ourselves. AS OF SEPTEMBER 2018, YOU HAVE HELPED US DONATE FUNDS TO PLANT 7,965 TREES! !